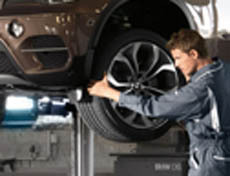 Wheel alignments on Mercedes Benz cars are fairly straightforward with no shims or bending required. Did you know few Mercedes require a 4-wheel alignment and some Mercedes don’t have adjustment mechanisms for all 4 wheels? Before you pay for a 4-wheel alignment that can’t actually be performed, bring your Mercedes to the experts at Dobson’s German Auto Service. We’ll adjust your wheels quickly and get you back on the road safely and affordably. Call for an appointment.